part 1 for when the Duke and Duchess had the title of Duke and Duchess of Calabria can be found here. "Their Royal Highnesses currently have two children, HRH Princess Maria Carolina born in Rome in 2003 and HRH Princess Maria Chiara born in Rome 2005." Charles would certainly like a son and heir to carry on his line's claim to the Headship of the Royal House. Someone says he is already the Headship of the Royal House! Yes, I was saying that he wants to have a son to succeed him. 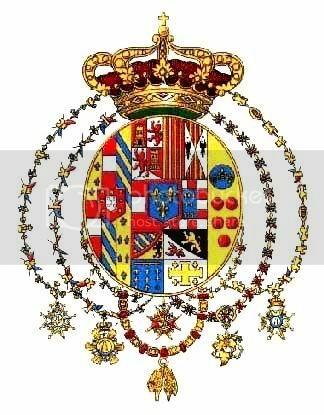 To make this clear, since the death earlier this year of his father Ferdinando Duke of Castro, Prince Charles has assumed the title of Duke of Castro and is one of the two claimants to the Headship of the Royal House of Bourbon-Two Sicilies. The other claimant is HRH Don Carlos who bears the titles Infant of Spain and Duke of Calabria. They may be related, but the Ruffo di Calabria family had their start in 1257 A.D., whilst the Bourbon of Two Sicilies family started to rule in Southern Italy from 1734 to 1860, and are of French/Spanish origin. So the Duke of Castro is a royal, whilst the Ruffo di Calabria are princes. I heard they were at the recent Cavadal wedding. Any photos? The Duke and Duchess of Castro at the "Heart for Children" charity event in Rome. Camilla is very pretty and subdued in the white dress, but I guess Mme Crociani still is a flamboyant dresser. YIKES! After looking pretty nice lately the suit at the wedding was awful! The ball gown was OK - it could have been worse! The duke looks handome but the duchess looks like she is trying to be a model no offense that is just what I am seeing in the photo. According to last week's Panorama mag, the Duke and Duchess of Castro have just bought a luxury hotel in Sardinia.